Those who remember the Just Jani column in the Sunday Times will be intrigued and delighted. Those who missed out on those heady times will be captivated by this universal story of betrayal, back-stabbing and life in the very fast lane. It is acerbic, witty, wry, bittersweet and exquisitely penned. She describes how she became a columnist, and reveals much of life behind the scenes at the Sunday Times. Jani shares details of the crucial interview with Eugène Terre’Blanche, details that will shake the preconceptions and ruffle more than a few feathers. Jani’s reputation is reduced to tatters when she takes on UK’s Channel4 in a law suit that reverberated around the world and kept the public baying for blood. But in all this we are able to see the real Jani Allan behind the fabulous brittle creature that the tabloids tore to shreds and devoured and then spat out. 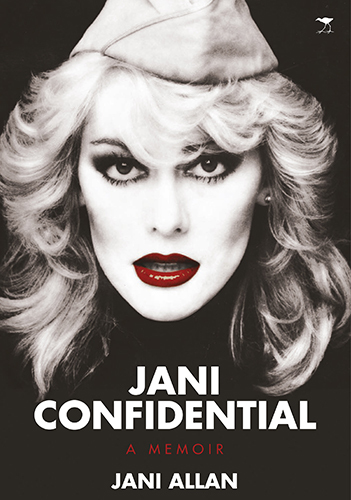 That the real Jani Allan, gutsy, bright beyond the telling, vulnerable and a story-teller beyond compare has chosen to share her story is a remarkable gift to the reader. It is a story that will command a great deal of respect. We were both in the habit of staying late at the office and soon she began inviting me back to her little home in Malvern, where she would polish off a box of wine and tell me about the man she had been in love with for some 20 years. They had met when they were working together at Armscor. Apparently for security reasons, involved couples cannot work together at Armscor and so she was let go. On Christmas Day she would put up a little tree and he would leave his bigger tree (and family) in Pretoria to spend a few stolen hours with her. I knew nothing of his identity. I would hear her talking about the G5 rocket and how he was on some covert mission to Iraq – or, as he called it, ‘Lapkopland’. Linda Shaw was the most obnoxious woman I had ever met. I liked her instantly. She had a smokey laugh, an exploded armchair hairstyle and long, long earrings that lurched and swung as she spoke. Her laugh was like blood gargling from a cut throat. She called everyone ‘ou bees’ and professed to hate babies. She carried a giant tote bag like an elephant’s scrotum. She was an Amazon. She was reckless and fearless. She lived in some undesirable suburb. Her flat-mate Alison was a dangerous girl too. It was rumoured that when Bonnie, some bloke she was dating, annoyed her, perhaps because she became pregnant, she and Linda smashed his motorbike. Some may say that it really doesn’t matter, after all this time, whether Linda betrayed me or not. But you see, dear reader, I think it does. She destroyed my life. And my future.